To plan for my LEJOG 14 day cycle route, It was important to lay out a specially defined LEJOG training plan. Not that I was an expert in cycling, but knew that if I was to stand any chance of completing the 14 day cycle and completing the 1000 miles, a cycle training plan was needed. The LEJOG cycle route we were to follow, organised by Peak Tours, was to follow the National Cycle networks (NCN’s) of the UK, this was ideal as it meant we were to give the major A roads a cold shoulder and stay away from traffic. On the downside, following the NCN route meant lots of hills so it was essential to get a good number of miles completed in the run-up. It is important to use the weekends to fit in 2 cycles, ideally a long and shorter cycle ride so your body (and backside!) begins to adapt to the daily grind of what it yet to come. Dont worry too much about the time it takes you to complete the daily miles, it is more important you are completing the route. Thanks for this info, I am doing LEJOG on 6th July 2012 and was looking for some kind of training plan. This is helpful and something to base mine on! No problem and thanks for your kind comments. 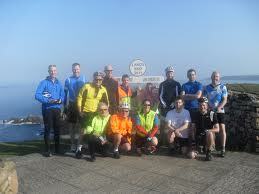 Good luck with your lejog, hope it goes well!